Values are in the forefront of all we do! Our core values of courage, compassion, and integrity are woven into every aspect of our students' experiences whether they are in the classroom, in the music room, in the robotics lab, on an athletic field, or just relaxing around campus. Our value-based approach to education allows us to create a community that is kind, caring, and respectful. 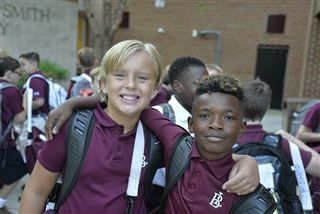 Read about how our lower school faculty instills these values in our boys every day. We couldn't be prouder!